Building Quality, Niche-Related Backlinks To Your Content. All three aspects of SEO are important in getting in good with Google, but the third one can be somewhat tricky if you don’t know what you’re doing or if you don’t have the necessary tools to create a good backlinking infrastructure. One thing that often concerns me is the use of automated back linking tools. Now I know some people who use these tools would probably swear by them, but in my opinion, automated back linking tools can do as much damage to your content than good. Prior to the recent changes in Google’s Panda and Penguin search algorithms, many internet marketers used automated back linking tools that provided a fast, convenient and efficient way of creating backlinks on several different types of website platforms. These tools were used to provide backlinks on almost any type of site you could think of from Web 2.0, to blog and article directories, forums, video marketing platforms, and list of other sites. Don’t get me wrong, these are all still great places to get quality back links to your site. But I find that when using automated link building tools, the ‘quality‘ of your back links to your content will decrease dramatically, which could cost you your first rank position on Google. And for some, the fall from the first page is much greater than others and sometimes it requires a lot of hard work to climb back up to the top. 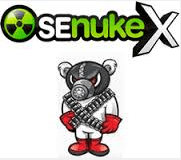 Long gone are the days when internet marketers could just buy an automated back linking tool, build their back linking infrastructure to their money site (your money site is often referred to the site that you are trying to rank for in search engines) and sit back and watch as the backlinks start building up. Most people don’t understand that SEO is a process and what I mean by that is implementing SEO, when done properly over time, can produce a dramatic increase in traffic and sales using your content. In my opinion, SEO works best if you provide organic back links to your quality content online by providing what are known as Tier 1 backlinks. Tier 1 backlinks are backlinks that you create through the use of placing links on sites with high page rank authority, but also has some correlation with your niche market. Building your own Tier 1 back links takes sometime, but will be well worth it in the long run. This gives you more control over what back links are pointing back at your content instead of an automated backlinking tool that spreading your link juice in places that it shouldn’t be. The best way to utilize your automated back linking tools is to use your Tier 1 back links as your money site within the automated tool to create what are known as Tier 2 back links. 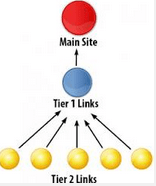 Tier 2 back links are links that point back at your organically created Tier 1 backlinks . This process ensures that you will maximize the likelihood of getting rank without receiving a penalty from Google because this back linking infrastructure will look more “natural” in Google’s eyes. I would recommend using an automated backlinking tools as an SEO strategy for promoting Tier 1 backlinks to get more bang for your buck as most of these tools that are being sold on the Internet can be quite pricey. If you currently using automated back linking tools in your SEO marketing strategy, I would love to hear how well they are working for you. I’ve used a number of different ones so I would like to get someone’s opinion on their experience with these tools. Please feel free to leave me a comment here on the blog. This entry was posted in SEO and tagged automated backlinking tools, SEO, tier 1 backlinks, tier 2 backlinks by Greg. Bookmark the permalink. I think the entire concept of backlinks is not that important. The focus of the blogging should be on creating content and then networking to get it out to the right people and maximizing it on social media. The best sites are successful because of their content and distribution, and not due to backlinks. Thanks for responding to my blog post. To some extent, you are right. Writing quality content is critical in driving traffic and would allow people to want to link to your content. But having the ability to build quality back links helps to drive that great content to the first page of search engines so others who wouldn’t normally see your content will notice it based on their searches. You bring up a very valid point though.